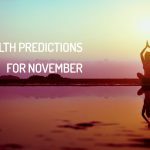 Looking for the health predictions for November? Stars have shown what to expect for November 2018 in what comes to health. Come and check it out! On November 6th Uranus will enter Aries, as part of its retrograde phase, which for the natives of Aries can generate some mental confusion or concentration difficulties. Fortunately, the Full Moon in Gemini on November 23rd, will play in the House III of Aries, sign that obsolete patterns of thought are ending, and that they are open to new ideas. On the other hand, although the asteroid Pallas will only be in the VI House of Aries until November 3rd, it is convenient to avoid rigidity in matters such as diets, physical exercise or results of occupational therapies. The restrictions and the desire for perfectionism at any cost can lead you to old habits, throwing overboard what you have achieved so far. Remember that it is about creating a new lifestyle, with which you feel comfortable, not a forced competition or a rigorous training that makes you feel frustrated and lacking motivation to continue. It is preferable to obtain long-term results, but to remain in time, to achieve immediate goals that will disappear before the clash with the reality. Another aspect that the natives of Aries must consider, during November 2018, is the entry of Mars into the XII House of the sign, on November 15th. Note that, in this location, there are also retrogrades Chiron and Neptune. Mars in the XII House of Aries evidences the dissatisfaction of the subject, before the subjects of his surroundings and especially of his past. It is possible that a complaining, self-critical or excessively pessimistic attitude is adopted due to retrograde Neptune in House XII. The Arian can try to evade the situation by occupying himself or others or by unloading his feelings in nearby people, due to Chiron retrograde in House XII. However, the beginning of the direct phase of Neptune on November 24th will bring a change of perspective. This points out that not everything is as bad as it seems, and that all the experiences of contrast have contributed to form the person you are today. With Juno retrograde in Taurus there is resistance in the moment of committing to those habits (new or disused), which you know contribute to your overall well-being. In this sense, the entrance of the asteroid Pallas in the VI House of Taurus on November 4th aims to better organize the goals and meet the needs of the physical body. However, it is also a transit that must be observed with care. Pallas in the VI House can promote an excessively rigorous behavior, both at work, in health and in the implementation of new habits of life. Listen to yourself, to your body, mind and spirit, and practice self-love and meditation. The first half of November 2018, the Sun will remain in the VI House of Gemini accompanied by Jupiter, until day 7, which translates into vitality and physical strength for the natives of this sign. Later, the entrance of the dwarf planet Ceres into the same sector of the astral map (House VI of Gemini), on November 11th, tells us about self-care practices that keep the subject motivated and focused on their integral well-being. The influence of Ceres in the VI House of Gemini is perfectly combined with the energy of the New Moon in Scorpio on November 7th, and the Full Moon in the sign of Gemini, on the 23rd. The first lunar event will affect House VI of Gemini and invites the natives to create new habits, this implies both daily routines (work or domestic), as what relates to food, exercise and medical care, such as check-ups and interventions. On the other hand, the full moon in Gemini on November 23rd will allow us to evaluate the processes undertaken with the New Moon, and put an end to negative behavior patterns, which you know threaten your development. Additionally, it is important to take advantage of the New Moon in Gemini to address issues such as managing internal dialogue and beliefs. Another aspect that you must take into consideration during November 2018, is the entry of the South Node to the VIII House of Gemini on November 15th, which although is a site that speaks of trust and shared assets, also alerts about the reappearance of old ailments and their aftermath. November 2018 will be a positive period for the health of Cancerians. The entry of the Sun and Jupiter into the VI House of Cancer, on November 8th and 22nd, respectively, speak of vitality and physical strength. These alignments also favor sport practices, and changes in diet and lifestyle. It is important that you consult with specialists in the field, if you decide to implement some modification in the daily diet or your level of physical activity, before starting. Remember that you will always get better results, if you follow a plan designed for you, instead of one taken from the internet or made for another person. You can apply the same strategy in other areas of your life, in which you feel particularly disoriented, such as taking a new business direction, reorganizing the home efficiently or finding a new style of clothing. It is worth noting that the North Node will move to Cancer, on November 15th, a transit that promotes personal transformation, the rediscovery of one’s own identity, and the assessment of the individual needs of the subject. The powerful energy of the North Node can cause some imbalance, so having professional advisors on the issues that concern you (food, business, health, lifestyle, exercises, image), is a valuable tool that you should not rule out. Keep in mind that Mercury will begin its phase of retrograde in the VI House of Cancer, on November 16th, noting an opportunity to analyze the changes that will boost your life, and its viability. Mercury retrograde in House VI of Cancer increases susceptibility to allergies, viral or respiratory diseases. So, if you suffer from a chronic ailment of this type, it is advisable that you pay attention. On November 15th, the South Node will move to Leo’s VI House, which for natives of the sign of Leo may mean the reappearance of old ailments, or relapse into unhealthy habits. If we approach it in a positive way, this transit allows us to observe in detail the situations and patterns that undermine your well-being, such as excessive work, constant stress, addictions, and compulsive behaviors, among others. Keep in mind that in the VI House of Leo Saturn and Pluto remain, in addition to the asteroid Vesta. In short, if you want to see changes, you must take responsibility for them. Vesta and Pluto in the VI House of Leo, favor contact with personal power, through introspection. These alignments facilitate the connection with spiritual guides, therapists and medical specialists, both to attend to illnesses and to receive accompaniment in the different processes that you undertake. November is a good month in what comes to health matters, as the stars are favorably disposed. Those natives that suffer from chronic complaints can experience considerable relief. This should, however, not lead you to throw all caution to the winds, but instead make you take normal precautions and at the same time enjoying the spell of good health. Any throat infection should be treated seriously, and properly investigated, Virgo! Chances are that nothing serious would affect you this month. This is also true of people who suffer from gout, rheumatism and excess of wind in the digestive tract. A good month during which, normal precautions should be enough for you to remain in the pink of health. Mars will enter House VI of Libra, on November 15th, which is good news for the natives of this sign, since the arrival of the warrior planet will increase the levels of vitality and physical strength. However, it is important to keep in mind that Mars also brings with it a certain aggressiveness, which although contained by the influence of Pisces (sign under which transit will occur), it is still an aspect to pay attention. The entrance of the asteroid Pallas a Libra on November 4th, will help you to organize the pending activities for the last two months of 2018 (November and December) and the beginning of the coming year. On November 6th, retrograde Uranus will enter Scorpio’s VI House, a planetary position that can cause nervous disorders, or injuries to the feet, ankles and head. However, this transit can take a positive turn if we use it to observe what causes us resistance (at work and at home), and situations that are triggers of psychosomatic ailments. Uranus is known as the planet of changes, and in its apparent phase of regression it shows how much we cling to established structures, and the fears that hinder any transformation. Likewise, Retrograde Uranus in Scorpio House VI can cause drastic and unforeseen changes at home or at work. Recall that, on this occasion, the celestial body is under the influence of Aries during his passage through House VI Scorpio, so there is a tendency to put personal wishes before obligations or responsibilities. Another aspect to take into account, during this period of the year, is the presence of retrograde Venus in the 12th House of Scorpio until November 15th. This stellar transit is favorable to receive psychological therapy, and work on issues such as self-esteem, old emotional wounds, and negative patterns associated with relationships. On November 5th, retrograde Uranus will leave House VI of Sagittarius, allowing the natives of the sign to recover, and enjoy the passage of Jupiter and the Sun over the sign of the centaur, on November 8th and 22nd, respectively. The planet of the expansion and the star king in Sagittarius, provide vitality and physical strength to the sons and daughters of the centaur, as well as an innocent optimism, interest in new projects and sharing experiences. However, it is convenient that you avoid overreaching by committing physical abuse, during this time of year, since Mercury will be retrograding in Sagittarius, from November 16th. Therefore, if you practice any sport discipline, you meet regular training or you lift weight at work, it is advisable not to exceed to avoid greater evils. It is also advisable to pay attention to the surfaces on which you walk, especially wet or dirt soil (Mercury retrograde in Sagittarius can cause respiratory problems and injuries in the lower limbs). If you want to change your exercise routine (or start a new one) consult a certified specialist, before doing so, and make sure it is ideal for your physical condition and not a matter of fashion or social pressure. Another aspect that you must take into account, during November 2018, is the New Moon in Scorpio that will take place on 7th and will play the XII House of Sagittarius, the sector of the astral map that is usually associated with the unconscious, mysticism and experiences of Past Lives. In general, the natives of Capricorn will enjoy good health, during November 2018. The Full Moon in Gemini on November 23rd, will touch House VI of the sign, and alludes to the revision of daily routines and habits of life. The lunar event marks the perfect moment, to evaluate the results obtained related to changes in diet, new sports practices, complex medical treatments, and modification of work rhythm or sleep patterns. If you have not made important changes in these areas, but you are interested in doing so, you are in a very favorable period for it. Just remember to consult with the appropriate specialists for each case. Sometimes, we believe that what works for other people or was beneficial to us at a certain time, can serve to reach a present goal, but, as we evolve spiritually, the needs of our physical body also do so. Hence the need to have expert advice, and a plan designed according to your requirements and goals. It is worth noting that Mercury will be retrograding in Capricorn House XII, from November 16th, which is an excellent transit to capture negative habits dragged from the past. Mercury retrograde in House XII of Capricorn can equally allude to obsession, either with diets, exercise or even work, resistance to release old structures, and misuse of your personal resources. Capricorn House XII will have a lot of movement, during November 2018. Not only will it be the house of the retrograde of the communication planet, but Jupiter will also enter this site, on November 8th, followed by the Sun, on the 22th. We cannot forget that the asteroid Psych is also in the XII House of Capricorn, a clear warning to the vulnerable aspects of your personality that you continually repress or try to hide from others. The entrance of Jupiter in the XII House of the Capricorn, points towards the welfare that you get when you pay attention to your balance. At the same way, it encourages you to exercise the spirituality inherent to the individual, through meditation, prayer or contact with nature. The planet of expansion in House XII stimulates generosity, gratitude and compassion, applied to people around you, even strangers, and especially to yourself, self-pity is a healing practice. On November 15th, the North Node will be activated in House VI of Aquarius, so the focus will be centered on your personal care, and the attitude with which you assume work and your daily obligations. The attention of the body and the spirit will come to your attention, and the Aquarians will recognize the true value of integral well-being, both for themselves and for the rest of the people around them. It will not be surprising that they decide to undertake changes in the diet, exercise, work or domestic routine, with the purpose of actively involving all those who are in their range of influence. On the professional level, you may find very good receptivity (the Sun and Jupiter in the XI House of Aquarius), although you must present your proposals on more than one occasion, due to Mercury retrograde in the House XI, from November 16th onwards. However, in the domestic sphere you could find yourself with much more resistance (Juno retrograde in House IV), given that the commitment of others is oriented towards different areas. At this point you must be aware that we are all different, and just as you value your independence, you must respect that of third parties, and allow them to join at their own pace if they wish to do so. The best option in these circumstances is to lead by example, persecuting your colleagues or colleagues will only cause the opposite effect, leading to frustration. Remember that retrograde Uranus will enter Aries, on November 6, and being your ruling planet will not go unnoticed. This transit also alludes to headaches, stress and growing discomfort. The presence of the asteroid Vesta in the House XII of Aquarius, where Saturn and Pluto are also found, will help to make you aware of this type of behavior. In general, the health of the natives of Pisces will have a positive balance during November 2018. The beginning of the direct phase of Neptune in this sign on the 24th, will allow you to gain more control over the mental and physical planes. As you will remember, Neptune is the natural ruler of Pisces so their transits usually have a direct influence on people of this sign, although their effects are not immediately perceived. On the other hand, the entry of Mars in Pisces, on November 15th, indicates an increase in the physical strength of the natives of Pisces. This planetary movement will be especially positive for those who are in the recovery stage of an illness or disease. However, the warrior planet also speaks of unexpressed anger, which can cause discomfort and frustration in the Piscean. In this sense, it is convenient that you work in constructive ways to express your feelings, without victimizing yourself. As Chiron is retrograde in Pisces, the existence of this type of patterns is easy to detect, and you can overcome them if you put interest in it. On the other hand, although the exit of Mars from the XII House of Pisces decreases the pressure in the unconscious and favors the processes of sleep and rest.